If you have been following my Grocery Fast over on Character Ink blog, you might be aware that I am trying to empty my freezers, refrigerators, cupboards, and pantries! 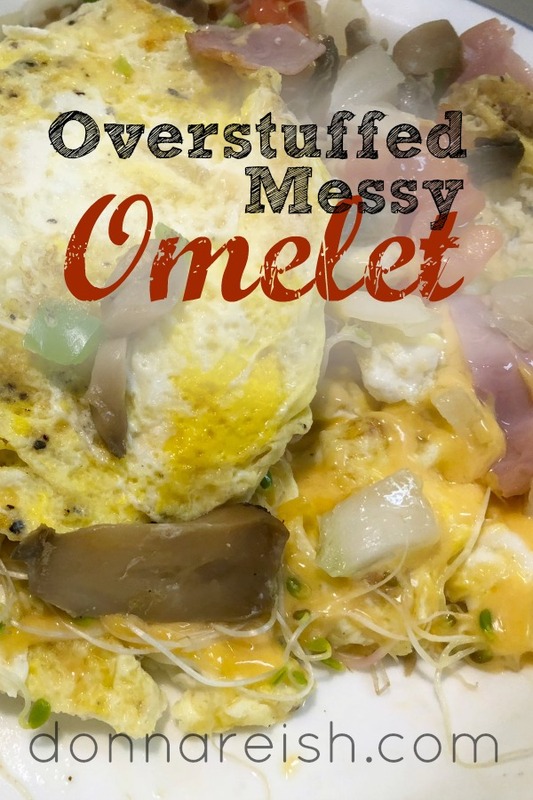 When you are trying to use up a little of this and a little of that or when you need to go to the store but want to make a meal first, eggs–in the form of omelettes, frittatas, quiches, and “skillets” (what we call loaded scrambled eggs)–are perfect! If you’ve got eggs, anything fresh at all in the fridge (even leftover meats! ), canned mushrooms or hot peppers, quite literally any cheese in any form ANYWHERE, and maybe even some little zipper bags of leftover frozen sausage or bacon (or any meats! ), then eggs are the perfect go to. One thing that I have learned while raising seven kids on one income for over two dozen years is that I DON’T want to go to the store at the last minute–for anything! It took extra time that I just didn’t have. I was the queen of subbing when I had a house full of kids….or making what I had the ingredients for (as opposed to running to the store for one ingredient to make one specific dish). 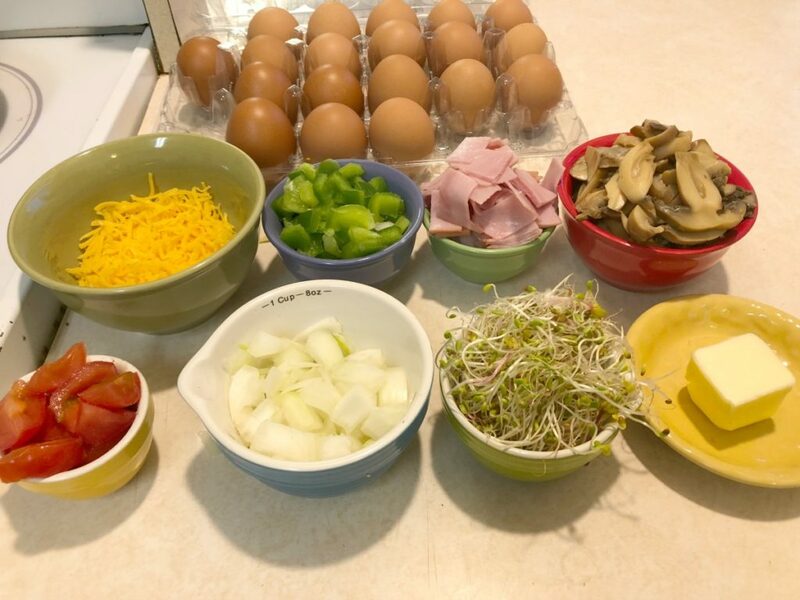 So eat eggs….and stuff those “omelets” (said loosely since this recipe isn’t exactly folded over!) full of other nutrient-dense goodness as well! Oh, and for those who practice Daily Intermittent Fasting, the egg is one of those perfect foods to open your eating window with! Prepare bacon in 12-inch skillet, air fryer, or oven until crispy. OR cube or shred other meat(s). Remove the bacon from the skillet and using some of the bacon grease (or grease from your bacon grease crock), start cooking the veggies with the garlic and onions and green peppers in the 12-inch skillet. Once these aromatics are somewhat translucent, add the tomatoes and mushrooms until heated through. Wipe the skillet clean with a paper towel and melt butter in the clean skillet. While butter is melting, whisk the eggs and seasonings. Swirl the skillet until melted butter covers bottom of the pan. Add half of the whisked eggs to it and cook. Lift cooked edges up and allow liquid to come to the edges to cook. Slide first "batch" out of the skillet and repeat with remaining egg mixture. When first side of second batch is cooked, flip so that "done side" is facing up. Load the entire surface with the meat, cooked veggies, and cheese.Top with the "done" batch (think quesadilla!) and cook until bottom is done and cheese is melted. Slide out of pan and serve!